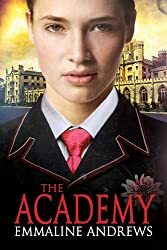 The Academy by Emmaline Andrews is a story of a young girl that disguises herself as a boy in order to get into the famed Royal Academy and train as a starship navigator. Kristina Jameson wants to travel the stars. Her twin, Kristopher, wants to play the violin. Their father has other ideas. In order to follow their dreams, Kristina goes to the Academy as a boy in her brother’s place. Tiny and unused to fighting, she struggles in her time there. Coming to her rescue is her new roommate, North, an unlikely ally. PS: If you don’t do ‘gay romance’ then this book is probably not for you. Although Kris and North are technically different genders (and nothing more than kissing happens in the book), North doesn’t know that. If you want to try it out, you can find The Academy on Amazon.